These great looking hardwood personalized photo frames are made of red alder and features a curved edge. 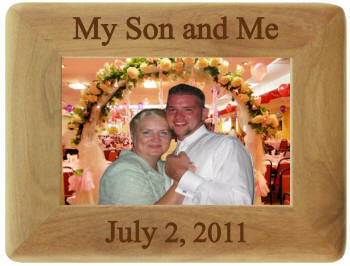 Although this hardwood frame shown with "My Son and Me", we can personalize this photo frame with any saying you desire. Other suggested saying are "Daddy's Little Girl" or "Mom's Pride and Joy". Available in 4x6, 5x7 & 8x10 sizes.